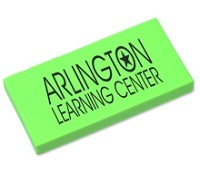 Rub-out your competition with a batch of Customised Erasers with logo branding! Since everybody makes mistakes, offer some correction in the form of a business gift that's sure to last, and our NeonCustomised Erasers with logo branding last years. Imprinted with a one-colour print of your company / organisation logo or brand-name, why not erase some of your competition and personalise these wacky erasers from a choice of neon colours such as Green, Yellow, Pink or Orange? Ofcourse - white is also available if you prefer a plainer looking eraser. Great to give to customers, students, teachers and more. Stand out from the crowd with our Customised Erasers with logo branding! For a FREE QUOTE, please fill in the form regarding our Customised Erasers with logo branding and we'll be able to help you. Why not look at our other promotional erasures available?